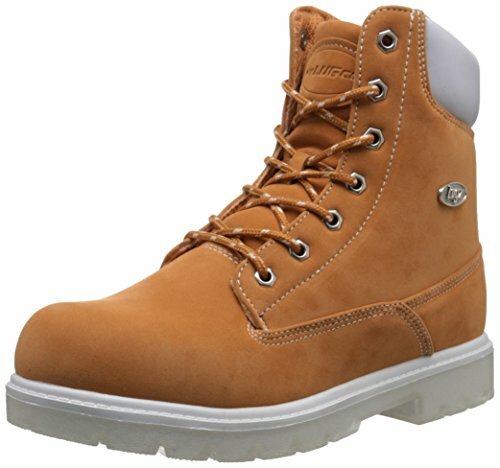 Are Timberland Boots vegan? The answer is no. According to their website, they don't make any boots without animal products. But these Timberland Style Boots are just as good! 3. Men's Black 6" Faux Nubuck Leather Work Boots by U.S. Polo Assn. Women's camel color faux suede work boot with a padded black faux leather cuff a la classic Timberland. Laces up in the front with a brown and beige bootlace and metal eyelets. Has a 1.5" stacked heel and rubber outsole for solid traction. Slender foot and almond toe create a work boot that doesn't sacrifice elegance. Advertised as vegan: No. These boots are advertised as faux suede and faux leather. Pros: Chic and feminine work boots for someone who wants a functioning occupational boot without a clunky appearance. Definitely wearable with leggings. Cons: The material may get scratched up pretty easily, and there's no mention of water resistance. 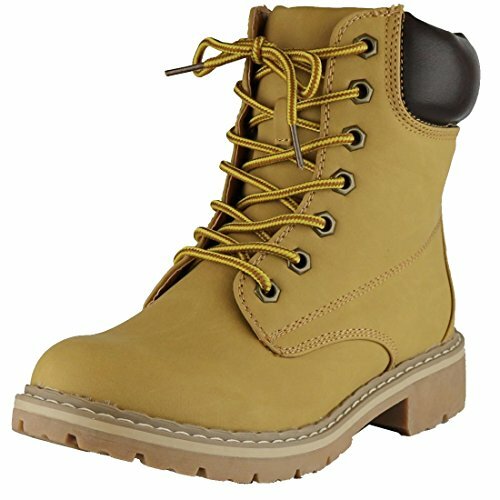 Men's golden wheat color work boot that looks like the iconic Timberland with a black padded collar and lace-up front. Sits at a standard 6" height that covers the ankle. Beige and off-white lugged rubber sole is slip-resistant for safe working. Ready for the outdoors with a water-resistant synthetic leather upper. Provides a cushioned insole and breathable lining for a long day of comfortable wear. Advertised as vegan: No, but the materials are described as man-made. Pros: Totally Timberland-esque and high-performance footwear you can rely on for demanding outdoor activity. The style is trendy and super slick — tuck in some slim jeans and throw on a nice pea coat for a go-to fall/winter look. Cons: None that we've discovered. 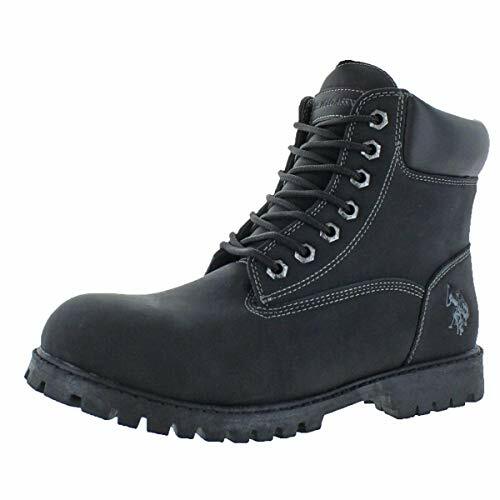 Men's casual fashion or occupational work boot in black faux nubuck leather. Ankle-high with a comfortable padded black collar and tongue. Laces up in the front with a black bootlace. Features white contrast stitching and an embossed U.S. Polo Assn. logo on the outer side of the heel. Black lugged rubber outsole provides grip and stability. Advertised as vegan: No, but the vendor states "all man-made materials." Pros: Stylish Timberland-style work boots in black to pair with black jeans for a streetwear style. With heavy-duty lugged soles, they should hold up well as active footwear. Cons: We're not sure how leak-proof they are for wet weather. 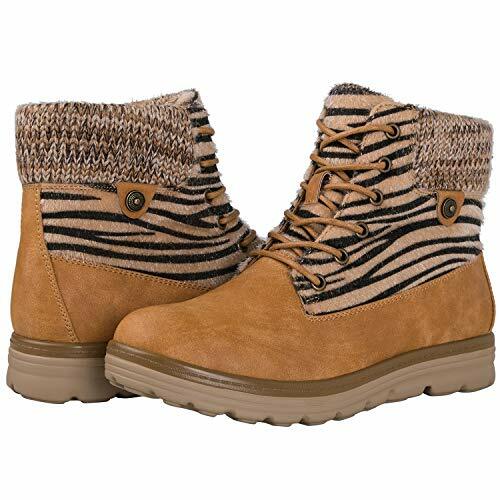 Fun women's camel color synthetic leather work boot with fuzzy beige and black zebra print on the upper half of the boot. Has a multi brown knit collar for added visual texture against the zebra print. Laces up in the front for a tight fit. Rests flat on the ground with a beige rubber sole. Advertised as vegan: No, but these boots are made from synthetic materials. 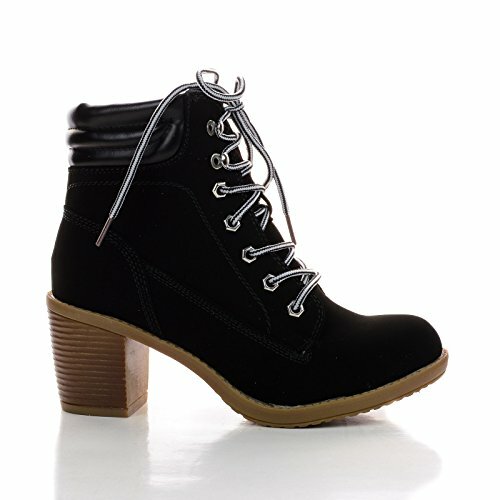 Pros: Very affordable and comfortable casual or light activity boots for fashionistas. Great look for cropped jeans to show off the funky zebra print. Cons: A little on the large side and probably not constructed for tough labor jobs or really physically demanding recreation. Best worn in fall — these are probably not suited to cold or snowy winters. Men's Timberland-style 6" work boot in Mars red synthetic leather. Repels water so you don't have to worry about puddles when you walk. Has a beige lugged rubber outsole for sturdy grip. Insole is cushioned to prevent soreness when you're on your feet all day. Advertised as vegan: No, but the product description shows all man-made materials. Pros: Durable, rugged boots that won't let you down when you need to get to work. The red color is so sharp that you may want these in your closet just to add that vibrant color pop. Try these with dark colors, a knit cardigan and a cowl scarf for a sophisticated approach to casual wear. Cons: A little bit pricier than many other non-Timberland work boots out there. Women's soft wheat color combat boot in faux leather that looks just like a slightly taller Timberland boot. Reaches over the ankle but stops just before the calf. Has a black padded faux leather cuff for scratch-free wearing. Built with a lightly padded footbed to keep your foot comfy. Lugged 1.5" sole is top-stitched with white thread and offers excellent traction. Pros: Super inexpensive alternative to Timberlands. The combat/work boot combo makes for fashionable casual footwear you'll want to pair with cute jean shorts in the summer or with flannel in the fall. Cons: Can be used for work in the short term, but these boots aren't quite durable enough to last with heavy use. Resilient men's work boot with a protective steel toe in chamois color leather-like material. Has a padded black collar that slants stylishly downward toward the back of the ankle. Features diagonal layering and stitching details for a symmetrical and pleasing design. Lined with a memory foam insole to perfectly fit the shape of your foot. Prevents serious slippage with an oil-resistant lug outsole. Advertised as vegan: No. Payless shows all man-made materials in the product description. Pros: Inexpensive and nice-looking work boots your feet will thank you for. They'll get you through long days of hard work with all the comfort and safety you'd expect from a tough work boot. It's hard to say if they're really warm enough for winter, but since they're waterproof, they should hold up in the snow. Cons: The uppers may not last quite as long as the soles do. Women's vogue high heel work boot that costs a lot less than its trendy Timberland cousin. Black padded cuff has white contrast stitching for a little something different. Laces up to the top of the boot with a yellow and brown bootlace. Synthetic block heel has a stacked appearance for nuanced texture. Has a graceful, slightly tapered round toe. Advertised as vegan: No, but the boots are advertised as synthetic in the description. Pros: Sporty meets dressy: made for denim skirts and statement jewelry. These are head-turners just like high-heeled Timberlands, but for a fraction of the price. Cons: Not meant for chilly weather (unless you wear really thick socks). Reviewers mention that they scuff up easily, too. Men's high top work boot in caramel-toned faux suede with a white padded collar and matching white sole. Made of water-resistant Durabrush faux suede. Collar and tongue are padded and soft against the ankle. Cushioned with a patented Flexastride memory foam insole. Sole is slip-resistant and has a cool transluscent cover on the bottom. Advertised as vegan: No, but these boots are made of synthetic materials. Pros: So fresh. Wear these with chunky knits and mixed textiles in the winter. Comfortable footwear to keep up with an active lifestyle, but they're also very trendy right now. Cons: Somewhere between moderate and high pricing. Still cheaper than Timberland boots, though. Pretty coral pink women's work boot in synthetic leather with a matching pink padded collar. Laces up through silver eyelets with a pink bootlace. Low white platform sole is slip-resistant with a 1" heel. Flexastride memory foam insole retains the shape of your foot. Upper is water-resistant so you don't have to worry about a change in the weather. Pros: Don't be fooled. These boots are rugged and fashion-forward. They've got snazzy Timberland style with an updated appearance in a bold coral color. You'll feel pretty fly in these with some distressed jeans and a cropped jacket. Cons: Honestly, we're not sure we can find any! Unless you plan to take these on serious mountain climbs, we think these boots will hold up and look great.